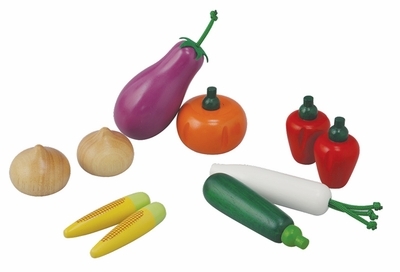 Plan Toys 3453 - A wooden set of vegetables includes an egg plant, a pumpkin, a zucchini, a white radish, two onions, two red bell peppers and two baby corncobs. White radish measures 5" long. Made from rubber wood. Printed with non-toxic soy ink and water based ink. Recommended for 3 years abnd up.